Just in case you’re counting, we’re under a month until Advent begins. (Cue all the panic!) My children are beginning to look forward to the change in our standard curriculum, as we switch to Advent plans with more focus on our Catholic faith. 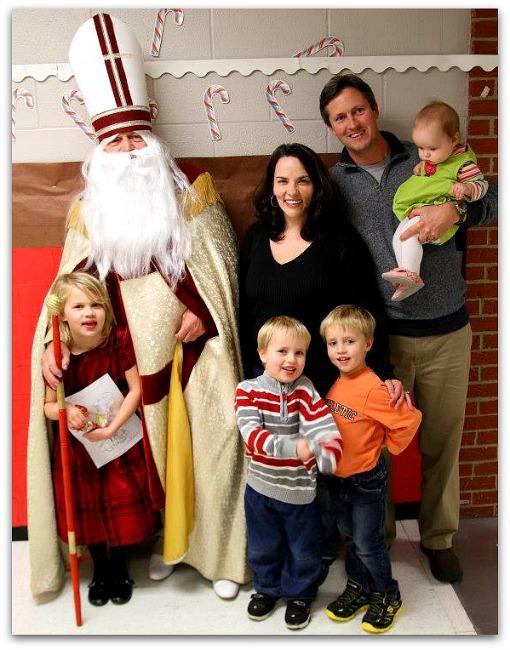 During Advent, our family studies the beautiful traditions and saints of this liturgical season. Our anticipation is palpable. We’re gathering our books and clearing our calendar to prepare our hearts and minds for this incredible time of year. We’ve got a pretty good handle on our Advent activities and ideas, but I’m always interested in adding more resources to our arsenal. I love chatting with other Catholic families to see how they celebrate, and what Advent traditions they follow in their home. But what if you’re new to celebrating Advent? Overwhelmed at where to begin? If you’re looking to bring the richness of Advent traditions into your home, Morning Time is a wonderful way to begin. Disclaimer: I’m blessed to have received these Advent plans for free. I was compensated for my time, but these opinions are all my own. If you’re scratching your head and wondering “What’s Morning Time? How am I supposed to fit THAT in my schedule?”, chill. You can explore the concept here. 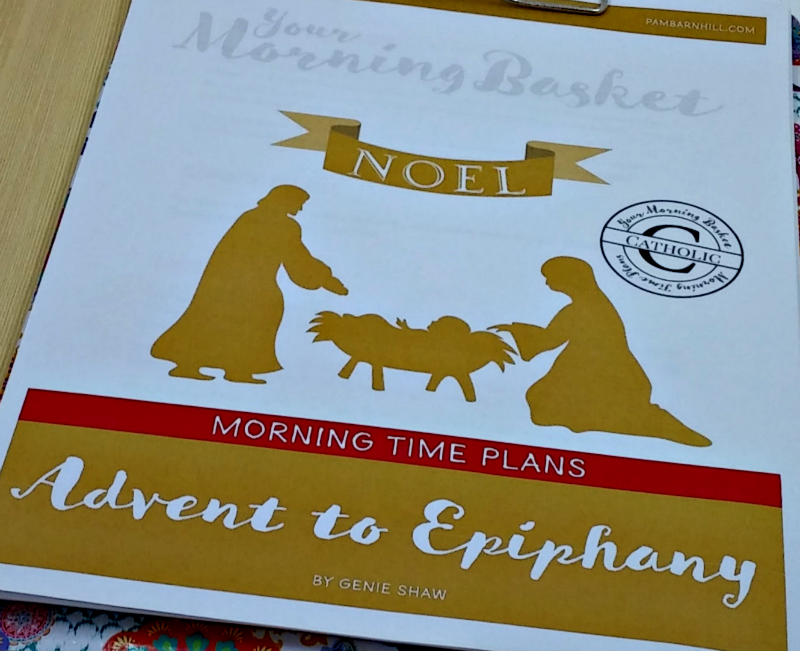 When you’re ready to begin, start with the Your Morning Basket Advent to Epiphany plans. I’ll break it down for you, section by section, to see how you can use these in your home. What’s Included in These Advent Plans? When you open up the Advent to Epiphany plans, it’s easy to get a wee bit overwhelmed. Don’t stress. You don’t have to do every.single.thing included in these plans. Just like any good resource, it’s a starting point. Make it work for you, and not the other way around. I’ll show you later what I chose to pursue, and what I chose to leave out of our family routine. Six hymns are included for your family — four Advent hymns, as well as one each for Christmas and Epiphany. You can study the music, composers and instruments, or (like our family), create a playlist to enjoy as the morning begins. The selection for Advent is the Prologue of John. There’s a WONDERFUL Your Morning Basket podcast episode with Dr Kevin Vost with tips and tricks for memorization. It’s a must listen. Reading the Daily Mass readings is a wonderful way to stay connected with our Church, and expose our children to the language of Mass. For Sunday Mass, my kids love the Magnifikid Spiritual Guide for children. 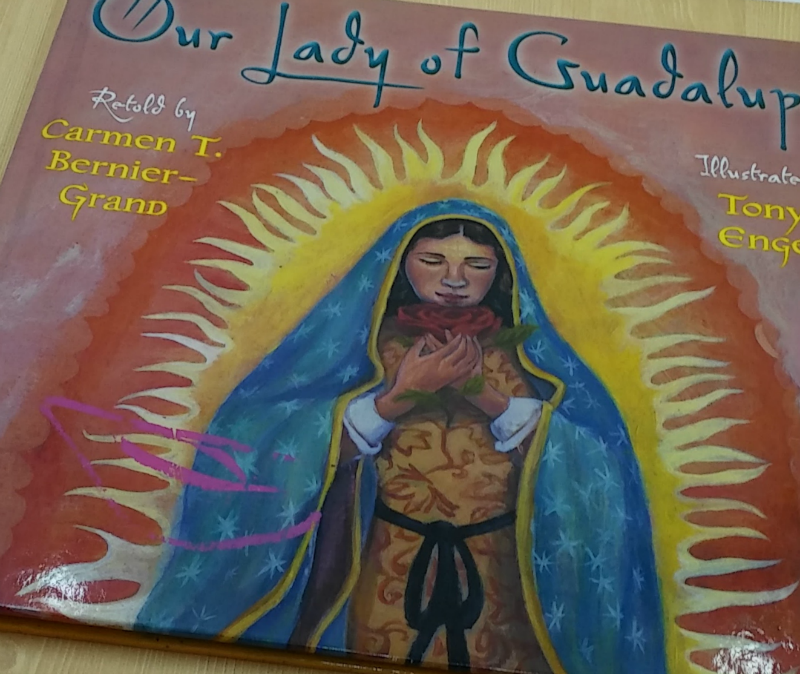 It helps them to follow the Mass, plus provides vocabulary guides for more difficult words in the readings, along with questions for discussion. 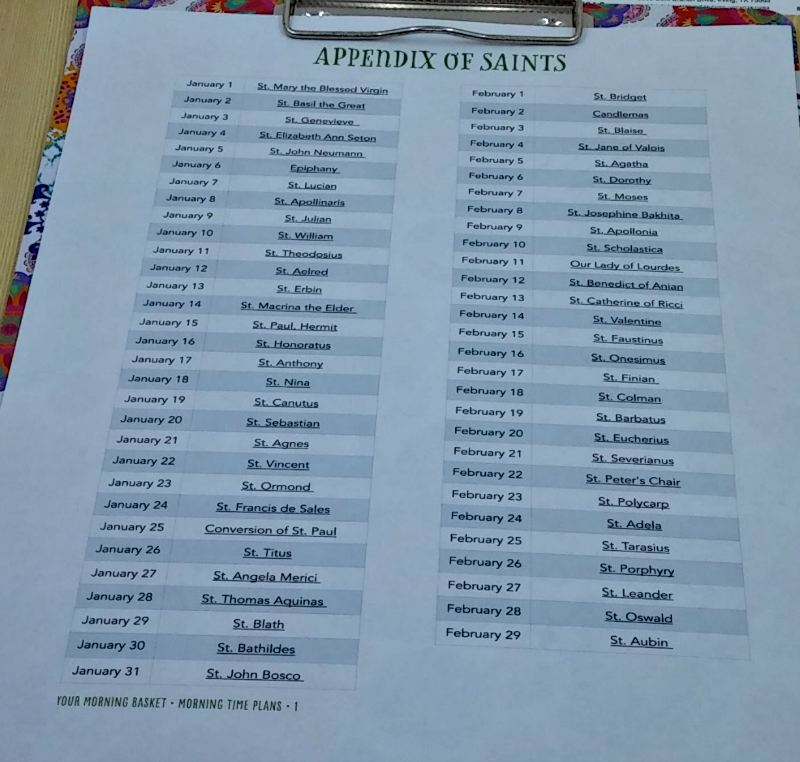 The Advent lesson printables begin with a year round list of Catholic saints This resource is arranged by the day, and has resource links so that your family can explore more about the saint or feast day celebrated. It would make a great companion to our Catholic family calendars. 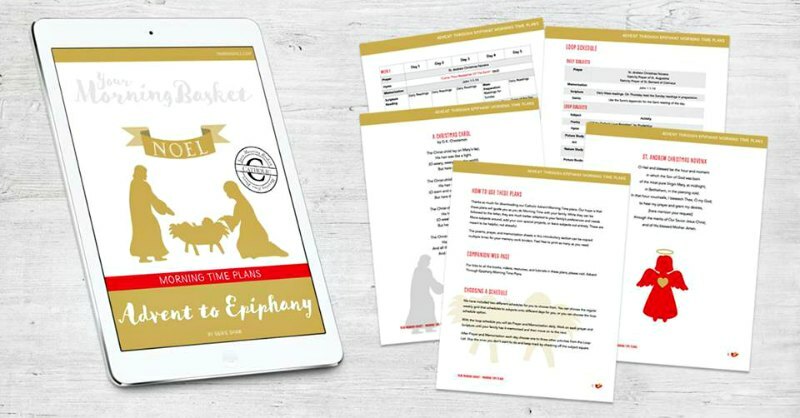 The Advent to Epiphany plans include selections of poetry to read and enjoy with your family. You can make it simple, just reading aloud, or dive deeper, studying the poem more in depth. 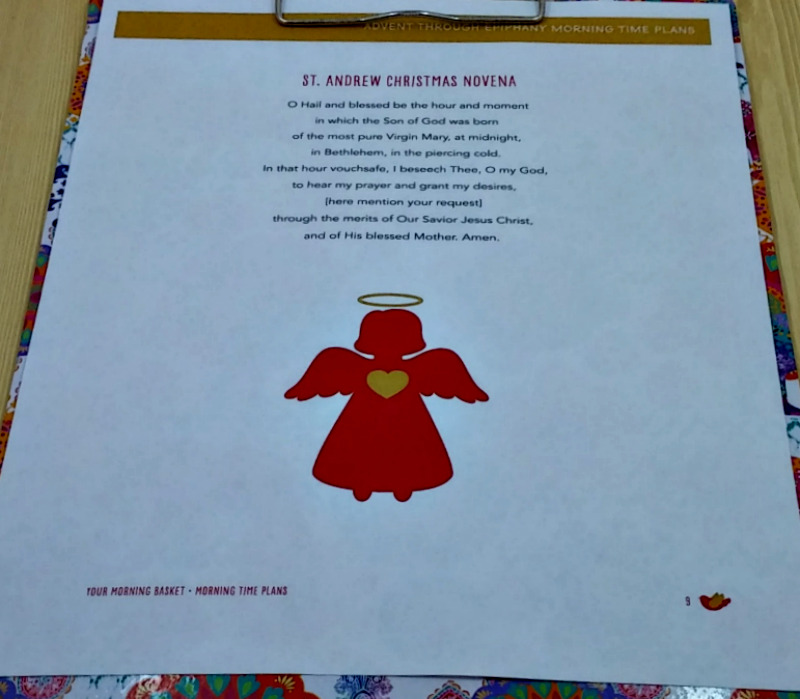 The Advent Lesson plans include Advent and Christmas themed masterpieces to explore with your family. Getting out for a bit of fresh air is a great way to get the wiggles out, and learn about the world around you. 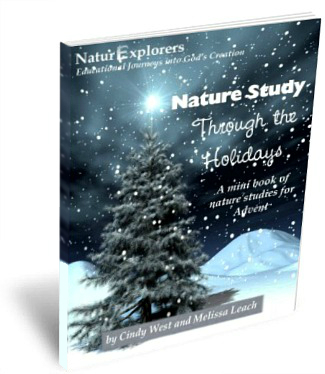 Note: This will require the purchase of Nature Study Through the Holidays. If you ever get a glimpse of my kitchen table, you’ll know that my kids LOVE art projects. During Advent, we love to pull out our chalk pastel courses and listen to Christmas music while we draw. In the Advent lesson plans, you’ll find some simple chalk pastel lessons for your family to enjoy. 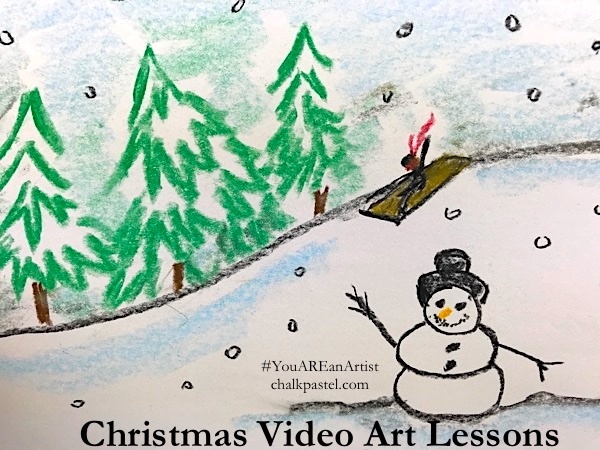 Note: the tutorials included as a resource are free, but we’re also investing in the Preschool Winter Art Lessons, as well as the Christmas and Nutcracker Video Lessons. Read alouds are my very, very favorite part of my homeschool day. I love settling down with a cup of tea and reading while the children listen. 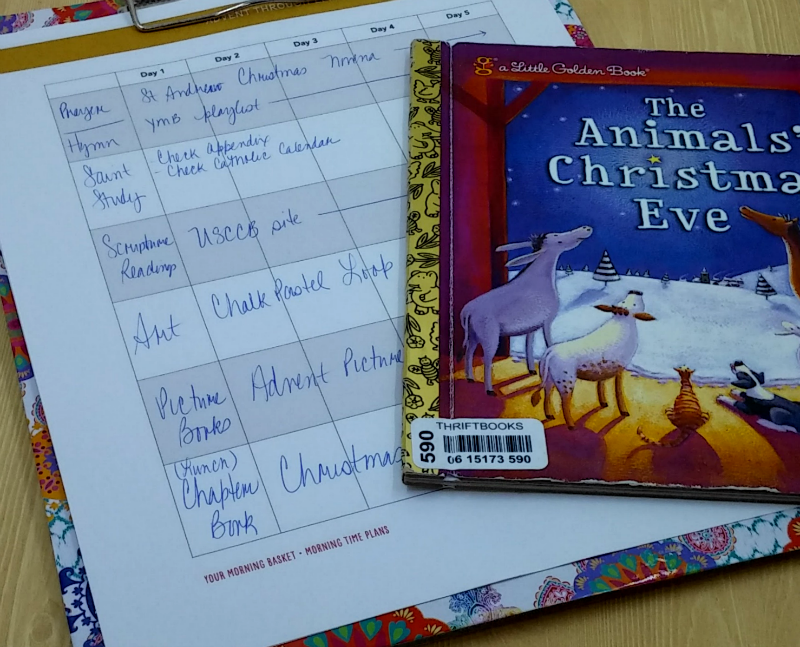 I’ve amassed a fairly extensive collection of Advent books over the years, but I spied more ideas in the chapter books and picture books listed in these Morning Time plans. The read alouds are included as a printable for taking to your library, or adding to your Amazon wish list. Everyone’s Morning Time will look a little different. My favorite? The blank lesson plan. We’ll be pulling pieces out of the weekly plans and arranging them to better suit our family style. I took the weekly list and the readalouds, highlighted items I wanted to tackle, then rewrote our plans on the blank sheet. Ta da! Remember, we’re making it work for our families. Who Needs These Advent Plans? 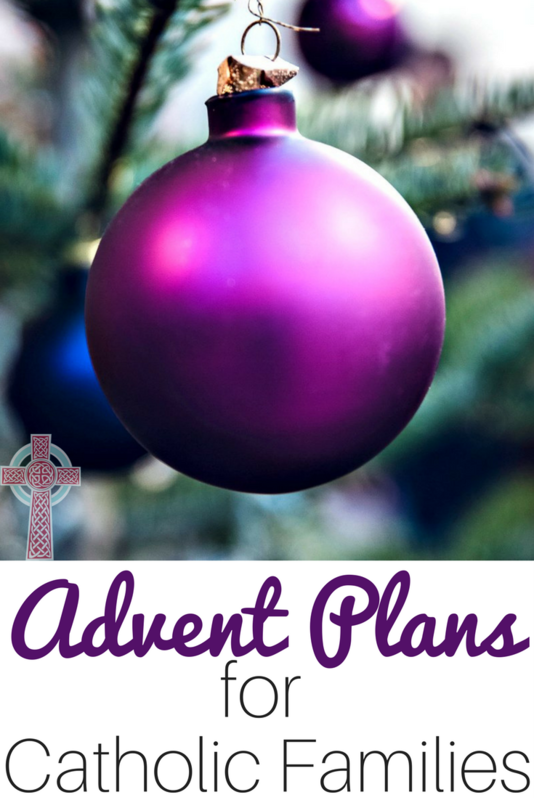 As I’ve explored these lesson plans for Advent, I can see how they would be useful for a variety of Catholic moms. Think about this. Are you a Catholic mom, sending your kids to public or parochial school? No problem. You can use these plans to guide you with read alouds to connect with your kids after school and on weekends. Working as a catechist or religious education teacher? Bingo. Pull out the music and art study for your class time. Catholic classroom teacher? These lesson plans have you covered. 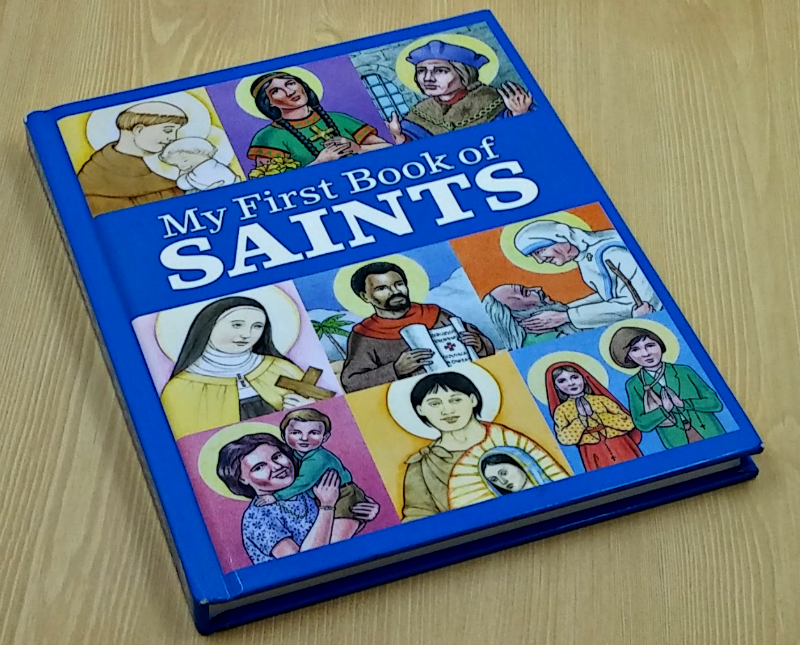 Use the saint study resources as a jumping off point for discussion in your classroom. Catholic homeschooling momma? These plans are tailor made for you, lady. Pick and choose what you want to use, and gather your materials. You’ll learn right alongside your littles. Will These Advent Plans Fit in My Homeschool Budget? If you’re not ready to buy, or you’re looking for something special without a Catholic focus, you can pick up these Christmas Celebration Morning Time plans or these Advent Morning Time Plans absolutely free. How Do Our Advent Plans Shake Down? When I first opened these gorgeous plans, I’ll admit, I hyperventilated just a bit. I approached this homeschool year with loads of hubris, and I really paid for it. I didn’t take into consideration how juggling multiple grade levels, a little one at away kindergarten, plus middle school woes would affect my game plan. We’ve done a lot of adjusting, and are finally into a good groove. I want to add richness to our homeschool during the Advent season, but I know myself, and I have to be very careful not to add too much and flame out spectacularly. So, I took these Advent ideas and chose the ones I knew my kids would adore (chalk pastels), areas that were important to me (saints study, prayer and Scripture), and things that bring me joy (beautiful music and reading aloud). My morning time plan is simpler than the original, but still beautiful, and designed to bring our family together to celebrate our Catholic faith. Let’s hear about your Advent plans. What do you have on tap? I’m still the mom running around Michael’s Crafts at the last minute trying to find the right color candles!